Telerik RadDiagrams are a powerful diagramming framework that can bring to life your rich data-visualization scenarios. 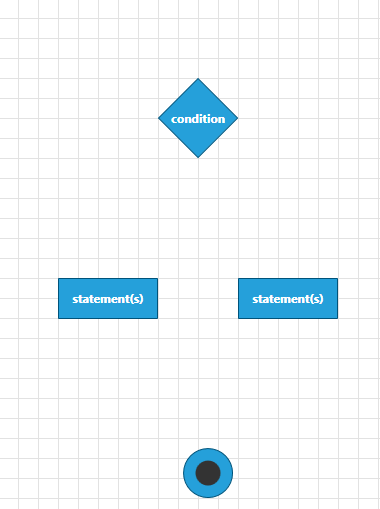 This tutorial will walk you through the main concepts and tools of the diagramming framework and help you to create the flow diagram of an "if-else" operator. You can find more info about the Telerik UI for WPF dependencies in the Controls Dependencies help article. Graph - this is the structure that contains the RadDiagramShapes and RadDiagramConnections. In the Telerik Diagramming Framework, the graph is represented by the RadDiagram class. Shape - the shape describes a node of a Graph that in the Telerik Diagramming Framework is represented by the RadDiagramShape class. Connection - the connection describes the edges of the graph and it is basically an object that connects zero, one or two shapes. In the Telerik Diagramming Framework, the connection is represented by the RadDiagramConnection class. The RadDiagram items are represented by the RadDiagramItem class. Therefore, both RadDiagramConnection and RadDiagramShape classes derive from the RadDiagramItem class. In order to populate the RadDiagram with RadDiagramItems, you can add RadDiagramShapes and RadDiagramConnections in the RadDiagram.Items collection from code-behind (read more) or declaratively in xaml (read more). Also, because the RadDiagram control is a data-driven control, it supports data binding. In order to bind the RadDiagram to a collection, you can use its GraphSource property. Note that when the GraphSource property is set, the Items collection is made read-only and fixed-size. For more information, please refer to the DataBinding tutorial. Please note that the examples in this tutorial are showcasing the Telerik Windows8 theme. In the Setting a Theme article you can find more information on how to set an application-wide theme. Before proceeding with adding RadDiagram to your project, make sure the required assembly references are added to the project. When you want to create a diagram in your application, you first need to add the RadDiagram control, as it represents the main canvas onto which the diagramming tools and shapes are drawn. RadDiagram exposes a set of properties that allow you to customize the graph layout and operations. For example, you can set up the active mouse tool, specify if a cut, copy, paste or delete operation is allowed, and customize the background color, the cells' height and width as well as the GridLine thickness of the drawing canvas. 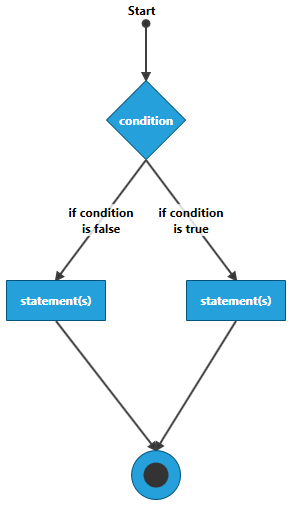 In order to create a diagram describing the flow of an "if-else" operator, you will need four shapes - two will represent the statements, one will describe the condition and one will represent the final result of the operator. Let's start with the condition of the "if-else" operator. In a block diagram, a condition is usually described by a diamond shape, called a decision shape. The RadDiagramShape exposes a Geometry property that allows you to create a custom geometry or use predefined shape geometry. The predefined shape geometries in the Telerik Diagramming Framework are described by the ArrowShape, CommonShape and FlowChartShape extension classes. For more information, pelase refer to the DiagramShapes tutorial. You can define the size of the shape and set its Content and x:Name properties to better describe it. 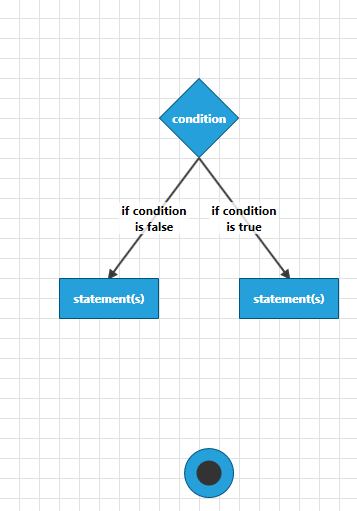 To describe the statements of the "if-else" operator you can use the default geometry of the RadDiagramShape. Adding multiple shapes in the RadDiagram without setting their position, by default, will position all shapes at the top left corner of the drawing canvas. In order to rearrange their layout, you need to set the Position property of each shape. 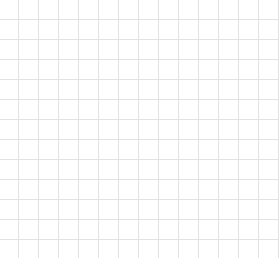 This property is of type Point and it gets or sets the coordinates of the top left point of a shape. To describe the final result of the operator you can use an ellipse shape. 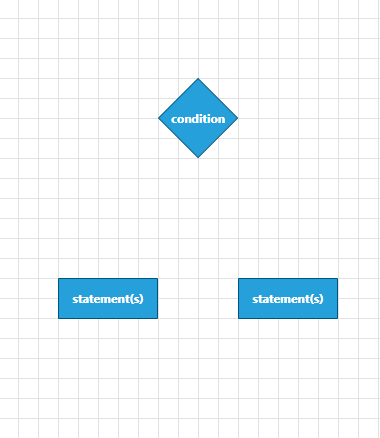 Telerik Diagramming Framework provides such a predefined shape. You can find a shape of type EllipseShape in the CommonShape extension class. The RadDiagramItem class exposes ContentTemplate and ContentTemplateSelector properties that allow you to customize the content of the RadDiagramShapes and RadDiagramConnections. 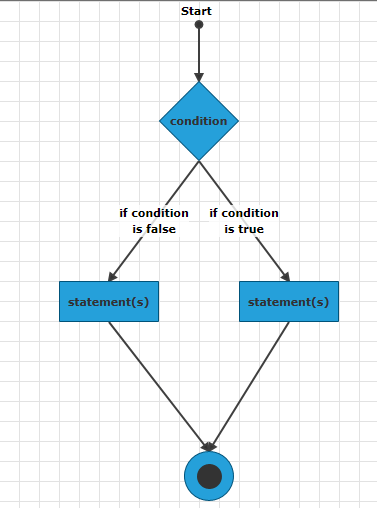 You can customize the content of the ellipse RadDiagramShape to mark it as the end of the "if-else" flow diagram. Finally, you can connect all shapes using RadDiagramConnections. The RadDiagramConnection class exposes a set of properties that allow you to define and customize the source and target of the connection. For more information, please refer to the DiagramConnection tutorial. 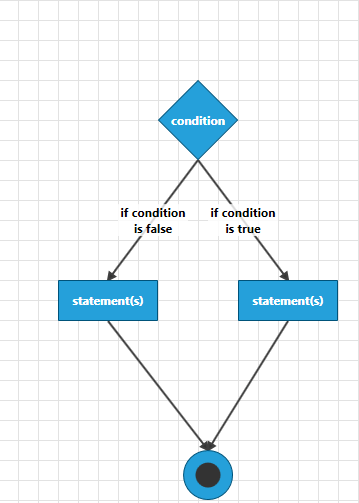 <telerik:RadDiagramConnection Content="if condition is false"
<telerik:RadDiagramConnection Content="if condition is true"
You can find the final XAML definition of the "if-else" flow diagram in Example 11.